Come winter and there is an abundance of fresh fruits and vegetables in our country. Red carrots, fresh pearly peas, grapes, amla and so the list goes on. In my family everybody loves green peas. In fact, since it is available all the year round in its frozen form, it is consumed almost daily in our diet in some form or the other. My husband makes lovely peas kachoris (on the lines of Gujarati lilva kachoris) on RARE ocassions ;) (Hope he is reading this and gets the message!) Hare matar ki sabzi, Maharashtrian usal, matar paratha, matar pulao are all tried and repeated recipes. I already made amla pickle, gajar halwa this winter to enjoy their seasonal goodness and wanted to try something unique with fresh peas. Nevertheless, I chanced upon this article on NDTV on 10 Best Winter Foods and there I spotted Nimona. And then soon again I saw its recipe on TV as one of the special dishes of Benares. It looked really good and tempting. Served on a thali with numerous other traditional heirloom dishes, it looked rich green and inviting. It is supposed to be had with pooris, rotis or piping hot rice (as one of my UP-bred friend pointed it out). So yesterday, I ordered 1kg of fresh peas, sincerely shelled them and got this lovely dish made. Some people make it with aloo, or moong dal wadis or simply plain without any additions. Onions, tomatoes and garlic too are optional. I googled and got many recipes for it with all these variations and then decided to get it done the satvik way - without onions - without garlic and with minimum spices - to enjoy the robust, earthy and mildly sweet flavour of peas, the way it is traditionally prepared in our City of Gods. Chopped coriander leaves and lemon wedges to serve along with. 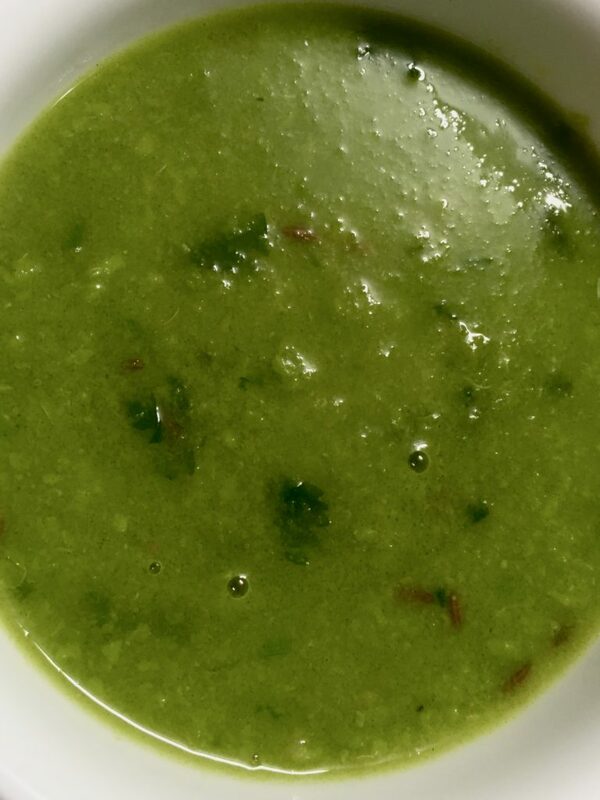 Grind the fresh peas along with the chillies and ginger to a coarse paste without adding any water. In a kadhai, heat the ghee and temper it with jeera and asafoetida. When the jeera starts changing colour, add the turmeric and peas paste to the kadhai and fry till the peas get cooked and its raw smell is gone. To this paste, add sufficient water and boil it till the mixture starts thickening. Add salt and boil it a bit. Adjust consistency with water as per your liking. Serve it with chopped coriander leaves and a lemon wedge on the side. We had it as a soup and paired it up with veg biryani for dinner.